Since I've begun eating healthier, I've been really trying to add new foods to the mix. One reason is that I'd like to get over my fear of trying new foods. I always worry I'm not going to like something and either waste the money spent on it or be forced to eat whatever it is I didn't like. A couple of weeks ago, I purchased my first box of Quinoa and we loved it. I can't even remember how I served it the first time. But this how I prepared it the second time! This recipe was a hit. I can't wait to make it again! Prepare quinoa according to instructions on package. Set aside. In a small amount of water, saute onion and peppers until tender. Add corn and garlic. Stirring often, allow to cook until corn is thawed. Stir in the cumin and chili powder. When fully combined, stir in the black beans. Add the enchilada sauce to the quinoa, then pour the quinoa mixture into the pan with the vegetables and beans. Stir in a couple handfuls of cheese. Pour casserole ingredients into baking dish that's been sprayed with cooking oil. Top with more cheese if you like. Then sprinkle with some jalapeno slices. Cover with foil and bake for 20 minutes. Remove foil and bake for another 10 minutes. I used just one can of enchilada sauce since that's what I had on hand. Two might be better if you're looking for the casserole to be a little more saucy. Still, was great using just one. Next time, I plan on using a can of diced chilies and mixing them into the quinoa mixture just like I do when I make a pan of enchiladas. I didn't measure the cheese. I rarely measure cheese. Instead, I add a handful or two when preparing a recipe. I tend to go light on cheese, so adjust to your liking. If you aren't a quinoa fan, substitute cooked brown or white rice or even some cauliflower "rice" would work well in this dish. I love quinoa! This looks great! I plan to nix the cheese and add avocado to make it a vegan meal. Thanks! 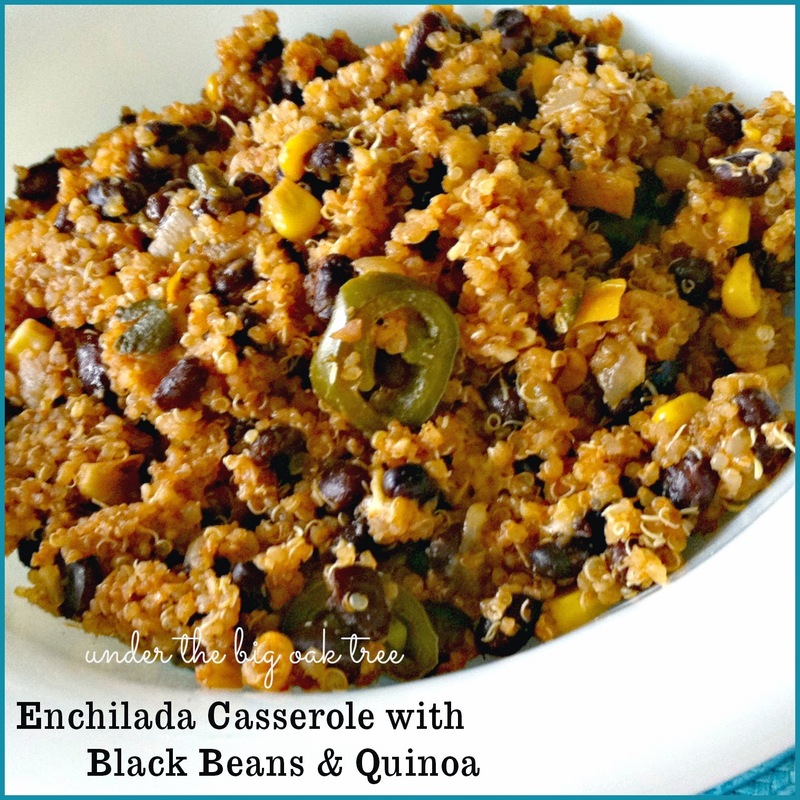 Thanks so much for sharing this awesome Enchilada Casserole with Full Plate Thursday this week! Hope you are having a fun weekend and come back soon! I've never tried quinoa either, but this looks so good I'll have to try it! Thank you so much for linking up at Tasty Tuesday! Your recipe has been pinned to the Tasty Tuesday Pinterest board! Please join us again this week!